333 pages | 115 B/W Illus. Remediation of groundwater is complex and often challenging. But the cost of pump and treat technology, coupled with the dismal results achieved, has paved the way for newer, better technologies to be developed. Among these techniques is permeable reactive barrier (PRB) technology, which allows groundwater to pass through a buried porous barrier that either captures the contaminants or breaks them down. And although this approach is gaining popularity, there are few references available on the subject. Until now. 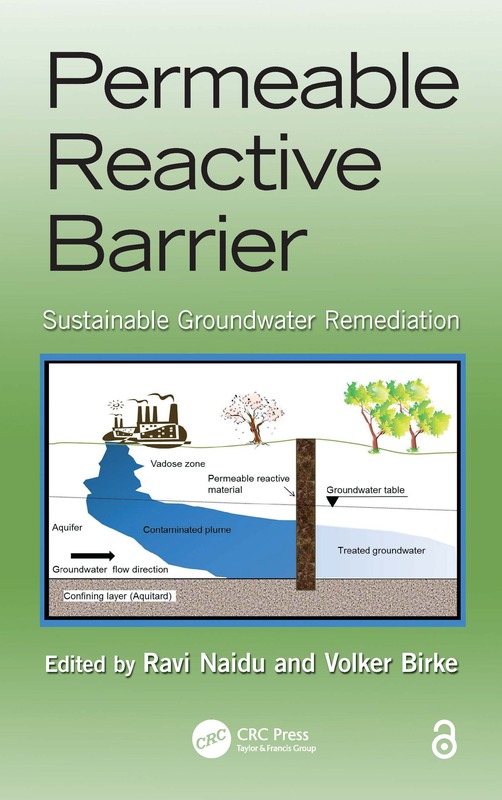 Permeable Reactive Barrier: Sustainable Groundwater Remediation brings together the information required to plan, design/model, and apply a successful, cost-effective, and sustainable PRB technology. With contributions from pioneers in this area, the book covers state-of-the-art information on PRB technology. It details design criteria, predictive modeling, and application to contaminants beyond petroleum hydrocarbons, including inorganics and radionuclides. The text also examines implementation stages such as the initial feasibility assessment, laboratory treatability studies (including column studies), estimation of PRB design parameters, and development of a long-term monitoring network for the performance evaluation of the barrier. It also outlines the predictive tools required for life cycle analysis and cost/performance assessment. A review of current PRB technology and its applications, this book includes case studies that exemplify the concepts discussed. It helps you determine when to recommend PRB, what information is needed from the site investigation to design it, and what regulatory validation is required. Professor Ravi Naidu is the chief executive and managing director of the Cooperative Research Centre for Contamination Assessment and Remediation of the Environment. He has researched environmental contaminants, toxicology, bioavailability, and remediation for over 20 years. Ravi has co-authored over 500 technical publications and co-edited 10 books in the field of soil and environmental sciences including field remediation of contaminated sites. His current research focuses on the remediation of contaminated soil, water and potential impacts of contaminants to environmental and human health. Dr. Volker Birke has around 25 years of experience in organic and environmental chemistry, particularly in green chemistry, the destruction of hazardous wastes and toxic compounds in the environment. He has experience in remediation of contaminated sites, hazardous waste management, and especially ground water remediation, with 12 years as coordinator of the large-scale German R&D program "RUBIN" for the application of permeable reactive barriers (PRBs) to ground water pollution, 25 years in the development and application of innovative ex situ and in situ remediation technologies to persistent organic pollutants (POPs), particularly mechanochemical dehalogenation (MCD) regarding ex situ treatment, as well as innovative ground water remediation technologies such as PRBs or nano and micro scale reactive particles for in situ treatment of polluted ground water. Another focus covers environmental analytics, especially regarding POPs such as polychlorinated biphenyls (PCBs) or dibenzodioxins (PCDD). He has been senior scientist, project leader, and senior lecturer in environmental chemistry and engineering at the Faculty of Civil and Environmental Engineering at the Ostfalia University of Applied Sciences, Campus Suderburg, Germany, since 2000. Since 2009, he has been commissioned to administer the professorship of chemistry at the faculty. He teaches the management of contaminated sites, remediation technologies, chemistry, physics, and mathematics for engineers and environmental scientists as well as occupational health and safety, with a focus on special applications and requirements for working in areas contaminated by hazardous compounds and at polluted sites. Dr. Birke has been involved in the management of about 50 remedial investigations, remedial designs and clean-up of polluted sites in Germany as well as abroad (Europe, the United States, India, Australia). He received a PhD in organic chemistry from the University of Hanover. Dr. Birke has published about 50 papers focusing on innovative ex situ and in situ remediation technologies such as mechanochemical dehalogenation and PRBs and is the main author of one book on remediation of contaminated sites using PRBs in Germany.